Brazilian regulators have ruled that Apple does not have exclusive rights to use the "iPhone" trademark in the country. But the US tech giant has already lodged an appeal against the decision with the Brazilian regulators. The ruling is the result of a local company, Gradiente Eletronica, registering the name in 2000, six years before the US firm. But the decision means that Gradiente has an option of suing for exclusivity in South America's biggest market. The Institute of Industrial Property (INPI) told the BBC that its decision only applied to handsets, and that the California-based company continued to have exclusive rights to use the iPhone name elsewhere including on clothing, in software and across publications. "I can confirm that INPI published today its decisions about eight trademark applications related to iPhone, from Apple: four applications were rejected and other four were approved," said the agency's spokesman Marcelo Chimento. 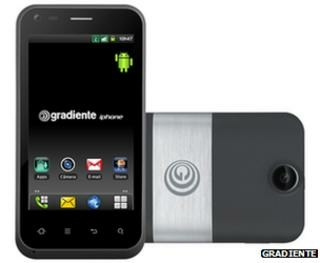 "Some were rejected because a Brazilian company, Gradiente, made an application for G Gradiente iphone in 2000 and it was approved in 2008. As Apple started its applications for iPhone in 2006, they were denied because Gradiente had a very similar register for cell phones applied some years before the American company. "The trademarks approved today for Apple were related to other classes, such as education, software development and advertising. Since they are in other classes, different from communications and telephones, they could be approved." Apple is asking the INPI to cancel Gradiente's registration through expiration - it is arguing that the Brazilian firm did not use the name within a five year limit. The Manaus-headquartered company now sells its Android-powered iPhone Neo One for 599 reals ($304; £196). Bloomberg previously reported that the chairman of Gradiente had said: "We're open to a dialogue for anything, anytime... we're not radicals." Apple's most recent financial results revealed its cash reserves had grown to $137bn (£88bn). The firm's manufacturing partner, Foxconn, currently produces iPhones and iPads among other equipment at its facilities in Brazil.